은 각 4폭으로 구성된 2점의 대형 궁중 장식화 병풍으로 해와 달, 산, 물, 바위, 복숭아 나무 등을 소재로 하여 십장생도와 같은 의미를 나타낸 것으로 여겨지며 특히 복숭아에 대한 길상 관념이 강하게 내재되어 있다. 이 그림에는 왕과 왕비를 상징하는 붉은 해와 흰 달, 한 개만 먹어도 천수를 누린다는 천도와 청록색의 바위산, 넘실거리는 물굽이, 억센 바위 등이 극채색 극세필로 그려져 있다. 해와 달과 산, 물결이 대칭으로 배치된 점은 그 소재와 상징성에서 어좌 뒤에 세워졌던 일월오봉병과도 유사하다. 표현 시각과 기법에서 탁월성을 보여주고 있으며 소재, 구도, 화법 등이 모두 뛰어난 작품이다. These two large four-panel folding screens were used for decorative purposes at the royal court. They closely resemble the style of the Sipjangsaengdo (paintings of the ten symbols of longevity), depicting the sun and the moon, mountains, water, rocks, peach trees, and so on. 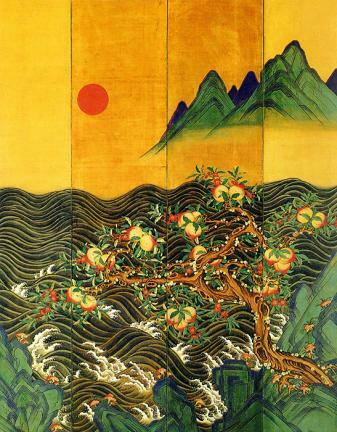 The large peach tree in the foreground was regarded as an auspicious symbol. The paintings depict a red sun and a white moon, symbolizing the king and the queen respectively; heavenly peaches, which were thought to bring health and a long life; a rocky mountain in bluish green colors; the undulating waves of a meandering river; and jagged rocks. They are painted in rich, brilliant colors with fine, intricate brushstrokes. 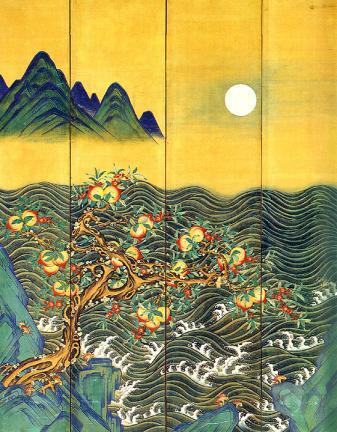 The symmetrical arrangement of the sun, the moon, the mountain and the waves, and their symbolic representation, closely resemble the irwolobongbyeong (Panel screen of the sun, moon and five peaks) that were placed behind the king’s throne. They are undisputed masterpieces in terms of their expressive technique, motifs, composition and artistic style.